408-779-2855 For more information, call us! "Living here at Valley Pines is perfect. Everything is here. I have three meals and the food is really good! I have my laundry done. Housekeeping and showers are great and the staff always has a smile. They are ready to help...Always." "I have been at Valley Pines for nine years and it feels like home. I feel loved by everyone. The staff is always checking on me, ready to help me. I don't have to worry about anything; they take me to the beauty shop, shopping and appointments." "I am so glad my Dad is here at Valley Pines. When my Dad was sick, everyone was so concerned and caring. The staff takes such good care of him. They do their work with extraordinary loving care and go the extra mile. The take their time and are never in a hurry. They love my Dad and I am so very happy Dad is here. Valley Pines is a great place." "Valley Pines, love it! Everybody is always concerned about me." "Valley Pines is the place to be, because everyone is so helpful. This is especially true when you are blind, which I am. And I have to say, the food here is really good!" "This is a beautiful facility. The Inn has been run by the same family since its beginning. Those who work there really do their best to make sure everyone is comfortable and happy. This place is great!!!" "I am very comfortable, Valley Pines feels like home." "Dear Caroline and Jim, Jan and I, and the rest of our family, thank you so much for the care and love that you have extended to our parents for so long. You are clearly serving God's wishes. Please extent our thanks to your great staff as well. We may "crash" your Halloween Parties in the future!" "To the Entire Staff at Valley Pines, Our family would like to thank each and every one of you for the wonderful care and the kindness you gave our Mother Nora during the three years she resided at Valley Pines. It was always comforting to know she was in such good hands, and with such a compassionate staff. We are also deeply grateful for the much needed extra care that was given in the last few months she spent there. In addition on the care for our mom, we all appreciated the cleanliness of Valley Pines, the continuous festive decorations and the ongoing mystery of a new outdoor project ☺ It was a joy meeting all of you and will miss seeing your smiling faces." "Dear Carolyn and Jim and staff, Our family would like to express our sincere appreciation for the care that Dad received at Valley Pines. We know it was difficult for him at first to adjust to the idea of assisted living, but you made the transition so much more pleasant for him. He came to think of it as home, and wanted to do anything he could to make it possible for him to stay there. We are so glad that he never had to make the next move to addition convalescent home, as that possibility often weighed heavily on his mind. We know you were often his "confidant", Carolyn, and thanks for taking the time to visit with him. And thank you too, Jim, for always checking on him and making sure his room was clean and comfortable. Dad also spoke highly of the rest of the staff and the kindness you showed to him. Please express our thanks to his tablemates and other residents who showed their care for him. We will miss him greatly and will always remember him as a wonderful father who loved and cared deeply for his family. It is sad to think of him not being with us any more but we know he is in a place far better." Dear Valley Pines, Thanks to youur caring family and staff, our father, Richard Hoffer, was able to enjoy his last years of life in good health and contentment. His home at Valley Pines was safe and carefree. You provided him with good company and good care, going above and beyond what we could have expected. We will never be able to thank you enough for helping us to give Dad what he really wanted - able home to call his own where he could count on a good meal and good conversation. Your generous and self-less efforts will always be an inspiration to us." "Dear Carolyn, Jim and Staff, Thanks so much for all the love and caring you gave my dad in the last months of his life. I am grateful to everyone at Valley Pines for showing so much concern, caring and loving. My dad told me how everyone was so nice to him and he felt he was well taken care of. He always said the food was hot and I would tell he liked it because he was eating better and his health improved. Thank you, Forest, for keeping the grounds in pristine condition. Dad and I both enjoyed how immaculate and neat the outside grounds of Valley Pines are kept. We enjoyed many wonderful walks around the manicured grounds looking at all the varieties of in ground plants (especially the cactus garden which was my dad's favorite), potted plants, fruit trees and the wonderful vegetable garden which we both liked to stop and admire. We both really enjoyed watching the different variety of birds in aviaries. Thank you, Esmeralda (and the housekeeping staff) for keeping his room clean and the community areas spotless and checking on him throughout the day. Thank you, Mary (and kitchen staff), for the fresh vegetable, fruits and healthy food you made. I always told my dad that I wished I was having dinner here because the food always smelled and looked so good. Thank you, Jim and Carolyn, for opening up your home and allowing Dad to live there and for your wisdom and how to deal with his reactions as he adjusted to his new home. Jim's moving- in advice: to take a step back, relax and let him settle into his new surroundings, on his own time and his own way; which also helped me adjsut to the move. Similarly, Carolyn's advice: to just let some things go and don't overreact to his reactions because this was all typical behavior, which also hepled me deal with my own frustations. The advice you gave me tremendously helped to navigate this next step in his life. Thank you, everyone, at Valley Pines for being compassionate and understanding. 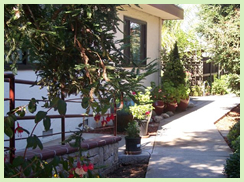 I really don't believe there is a better assisted living home in the entire bay area." "Carolyn, You truly are our "angel" for Mom! What an awesome, loving care- giver you are for all your Residents. Thank you is not enough to express our appreciation!" "Dear Carolyn, Jim and Staff at Valley Pines, we just want to reach out and thank all of you for the wonderful care Grandpa Ted received under your watch. He was very happy there and nothing but praises for all of you. Since we lived so far away he truly felt that you all were his second family. What a wonderful place to spend his last days. Caro, Thanks so much for all the personal time you devoted to him for Doctor Appointments and visits while he was in the hospital. Your presence aided to his sense of wellbeing, knowing someone was ther other than the hospital staff to assure that his needs were being met. "It feels like home" truly applies to Valley Pines.Thanks so much." "Dear caroline & jim, jan & i and the rest of our family thank you so much for the care and love that you extended to or parents for so long. you are clearly serving god's wishes. please extend our thanks to your great staff as your halloween parties in the future!" "Carolyn & Jim & staff, Words cannot express, the feeling of gratitude that I have for you all for taking such good care of my Mom. I know she can be difficult. It was really hard moving her stuff realizing that she would not be coming back there, I wanted to tell you this in person, but I just Thanks again, & God Bless you all." "Dear Carolyn, I am so grateful for the excellent care and kindness that give to my mom. You're also shared your insights about elders with me. I understand mom more and can better communicate with her because of you (I still have a lot to learn, too!) But more than anything else, mom loves Valley Pines, and especially you, I am grateful for the close relationship you've developed with her. You are such a gifted caregiver! Thanks for all you do."